LAS VEGAS, Nev., Jan. 3, 2017 /PRNewswire/ -- SLIDE, a developer of smart devices for smart consumers, will begin introducing its new line of digital projectors at CES 2017. The three initial models: ShowStream Mini Pico (PR1000), ShowStream Pro (PR2000), and ShowStream Master (PR3000) are designed to meet the needs of a variety of presenters from those who need ultra-portability to large conference rooms. The models feature Digital Light Processing (DLP) imaging technology, three levels of brightness (sensual, white, and color), variable projection sizes, and up to 20,000 hours of operation. See These New SLIDE Digital Projectors – along with the SLIDE Unlocked Smartphones, Wearables, Feature and Flip Phones, Tablets, and Computing Devices – at CES 2017 Booth #17317. "Give us a wall, we'll give you a world of possibilities," commented Raymond Levy, COO of SLIDE. "Regardless of whether these units are connected to a SLIDE device or any other Android, iOS, or Windows-based product, users will immediately get the big picture of a SLIDE projector's extraordinary capabilities. All three of these DLP models are lightweight and designed to be easily transported from room to room, building to building, or coast-to-coast." With DLP technology, these three SLIDE projectors produce smoother video with less pixilation than projectors using other digital technologies. They also provide truer black levels and higher contrast capabilities, resulting in a more realistic picture. Each features three categories of brightness: sensual, white and color. All models come with Android OS V4.4.2, Wi-Fi, and both physical and Bluetooth audio output. Input interfaces include: microSD, two USB hosts, CVBS (RCA), and HDMI. All three use an LED light source that is environmentally friendly, provides plenty of brightness, and has a life expectancy of up to 20,000 hours. All support 1080p high-definition resolution, as well as various video, audio, picture, and document file formats. 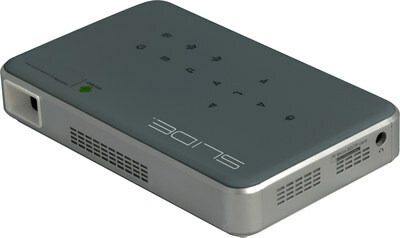 The SLIDE 854x480 pixel ShowStream Mini Pico projector is a small-format device that has all the characteristics of a larger projector. It is an excellent choice when extreme mobility and low-energy consumption is required. It projects quality images of between 14" and 11.7' in size from a distance of 19" to approximately 16'. It has a sensual brightness of 500 ANSI lumens, and white and color brightness of 100 ANSI lumens each. It may be powered by either the included DC power cord or the rechargeable Lithium battery. It has a 1.5W mono speaker, measures 5.38"x3.26"x0.98", and weighs less than a pound at 10.5 ounces. MSRP: $369.00. The 1200x800 pixel ShowStream Pro projects quality images of between 17" and 13.4' in size from a distance of 19" to approximately 16'. It has a sensual brightness of 2500 ANSI lumens, and white and color brightness of 500 ANSI lumens each. It has 3W stereo speakers, measures 8.46"x5.9"x2", and weighs just 1.8 pounds. MSRP: $599.99. The 1200x800 pixel ShowStream Master projects quality images of between 5' and 15' in size from a distance of 2" to approximately 20'. It has a sensual brightness of 2500 ANSI lumens, and white and color brightness of 500 ANSI lumens each. It has 3W stereo speakers, measures 12.2"x8"x4.3", and weighs a very mobile 9.9 pounds. MSRP: $999.99. These three SLIDE digital projectors will be available online and in-store. Smart devices for smart consumers, SLIDE is a new, cutting-edge communications brand that brings high value IoT products to today's consumer. From Android unlocked smartphones to tablets and Windows 2-in-1 detachable tablets, SLIDE is developing a new line of mobile devices that will meet the needs of today's consumer. Part of the Fesco Group, SLIDE is headquartered in Brooklyn, NY. For additional information, visit www.SlideUSA.com. © 2017 SLIDE. All rights reserved.